Leader-Telegram -- "A new industry continues to rise — quite literally — from the ground in west-central Wisconsin. 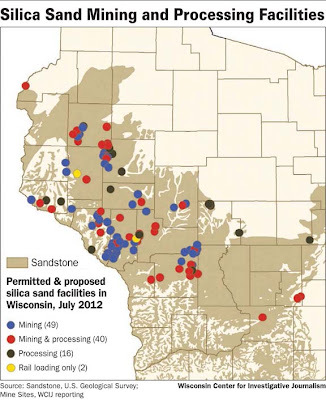 Officials from 12 regional counties reported the area now has a total of 52 silica sand mines that are either operating or approved (see map above). That's up 136 percent from 22 just a year ago and shows just how fast the sand storm is sweeping across west-central Wisconsin, which is home to plentiful deposits of a variety of sand prized in the rapidly growing energy extraction practice known as hydraulic fracturing, or "fracking." While some experts have been predicting a slowdown in the industry's dramatic rise from virtually nonexistent four years ago, county planners who deal with permits for the mines haven't noticed such a change. 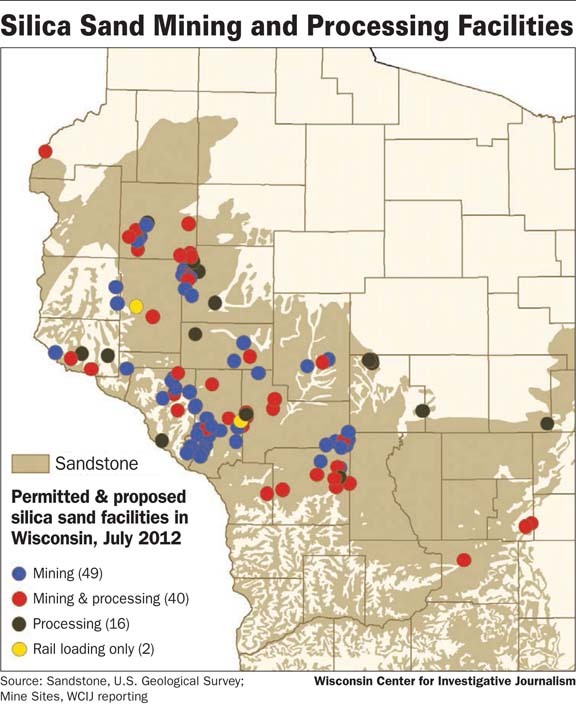 "It's still a boom," said Kevin Lien, director of the Land Management Department in Trempealeau County, which leads the region with six operating mines, 10 more on the way and another five applications being considered next month. Right behind are Barron and Chippewa counties, which both have eight operating or approved mines and two more that have been proposed. "I don't know if it's peaking yet. We just received two more applications," said David Gifford, zoning administrator in Barron County, which had only one approved silica, or "frac," sand mine a year ago." A problem for sand producers is getting the product to market. It takes 35 rail cars to deliver the 7million lbs of silica for each well being drilled. There is a railcar shortage to deliver these proppants. Investors looking for a "pure play" in sand have U.S. Silica as the only option (as mentioned in the link above). This company is building a major facility in Wisconsin.